Substantial investments have been made in public transport as part of the ambition to create an eco-friendly city district. The goal is for 80% of residents’ and employees’ journeys to be made by public transport, by cycling, or on foot. The eco-friendly adaptation has also resulted in substantial investments in green spaces, walkways, several large parks, a reed park with wooden jetties, etc. The “Tvärbanan” light railway runs through the centre of Hammarby Sjöstad, along the avenue, and carefully designed bus routes provide direct access into Stockholm City. A ferry traffics Hammarby Sjö throughout the year, from early in the morning until midnight, with an additional ferry operating between Hammarby Sjöstad and Nybroviken in Stockholm City during the summer months. Residents and those working in the area also have access to three car pools. Around 910 people have currently joined the car pool, which has a total of 46 cars at its disposal. Electric cars can be recharged outside the GlashusEtt information centre building. A new traffic link, Södra Länken, has been adapted in line with the town’s environmental requirements, and is a sunken road crossed by two “ecoducts”, leading to Hammarbybacken and the Nacka nature reserve. The town has pre-schools and compulsory level schools, a retirement home alongside Sickla Kanal, and health care facilities located in the centre of the district. Commercial services have gradually been expanded and the area now offers not only supermarkets but a fairly wide range of other commercial outlets. Sickla Kanal has a quay with mooring space for 100 or so small boats, and a further 80 spaces are being built in the Henrikdalshamnen harbour. A sports hall, Sjöstadshallen, lies to the east of the oak-covered slope on Sickla Udde. The Nacka nature reserve, Nackareservatet, on the southern side of the Södra Länken traffic link, has paths for walking, jogging and skiing. 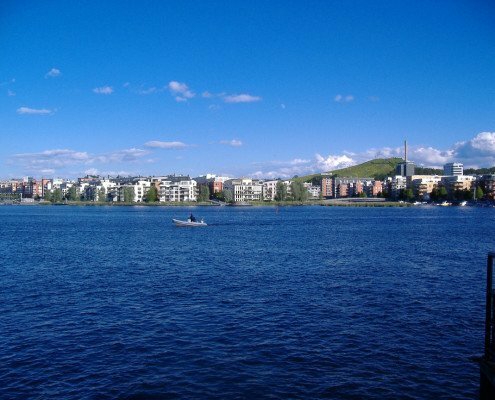 In the summer months, Sickla sjö offers wonderful swimming opportunities, while in the winter, the slalom slopes of Hammarbybacken are within walking distance. There is a library in Luma and a culture and theatre centre in Lugnet. Kulturama and Fryshuset offer both educational facilities and cultural activities aimed primarily at children and youngsters. Sofia parish conducts services in the Sjöstad chapel. The old Diesel factory, which now houses theatrical premises, a library, and puts on concerts and cultural workshops, is located nearby in the Sickla area. All new construction, whether it involves housing and commercial premises or the outdoor environment, is accessible by disabled persons, in accordance with the City’s disability policy.